Wayne LaPierre speaks during the Conservative Political Action Conference in Oxen Hill, Md., on Thursday. spattered country are embarking on a new quest for sensible gun legislation. But if real progress is to be made, we need to reject the deflections, distractions, and delaying tactics of the gun absolutists. So let’s look at a few of the arguments employed to stall meaningful action. First, from the precincts of the pixilated. 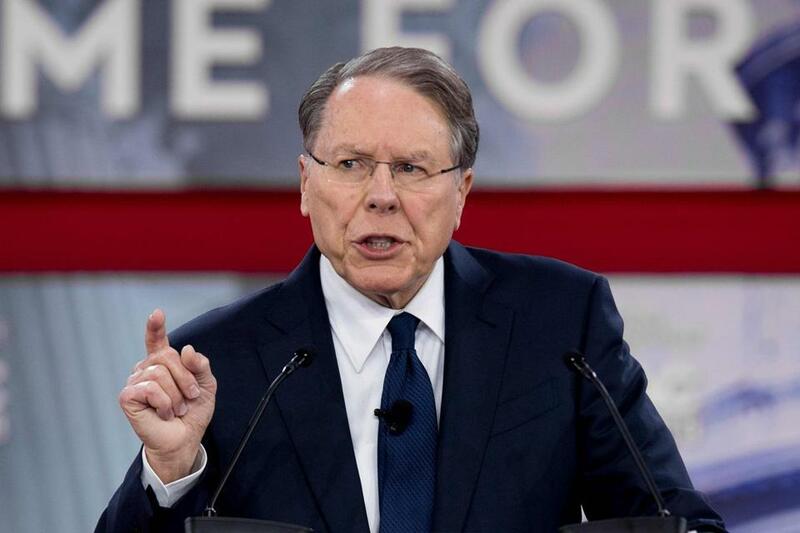 On Thursday, the National Rifle Association’s Wayne LaPierre delivered a Conservative Political Action Conference speech that, viewed charitably, revealed him to be a cross-eyed crazy conspiratorialist. Or, less charitably, a confirmed cynic committed to stoking the fires of fanatic paranoia. The goal of this country’s liberal elites, declared the NRA’s $1 million-a-year CEO, is “to eliminate the Second Amendment and our firearms freedoms so they can eradicate all individual freedoms.” Contemplate that: The NRA’s leader is seriously claiming that the real goal of those who favor tougher gun laws is to end America as we know it. We’re grown so used this kind of extremism that it barely registers any longer, but people should recognize LaPierre’s scurrilous charge for the rancid idiocy it is. Our next example comes from Speaker Paul Ryan, who in the aftermath of the mass gun murder of 17 people at Marjory Stoneman Douglas High School in Parkland, Fla., declared that now isn’t the time for action. “We need to think less about taking sides and fighting each other politically, and just pulling together,” Ryan said. Don’t be fooled. Ryan, an NRA favorite, isn’t waiting for a calm moment to undertake a dispassionate discussion of guns and violence. He, like much of the Republican caucus, is hoping that with time, the sense of urgency will pass, whereupon he will return to business as usual. 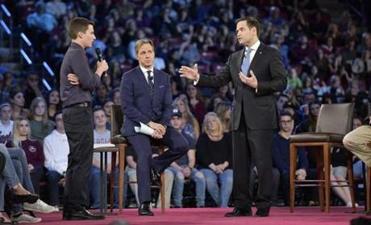 Rubio was put on the defensive Wednesday by angry students, teachers, and parents who are demanding stronger gun-control measures after the shooting rampage that claimed 17 lives. Um, no. As Stop Handgun Violence President John Rosenthal notes, every country has people with mental illness, but other advanced countries don’t have anywhere near our level of gun violence. Further, most mass shootings are not committed by those who are mentally ill, at least not as mentally ill is currently defined. Rather, the shooters are angry, alienated men, who are also usually young and white. One can speak loosely about them as being nuts or sickos, but here’s the reality: Unless they have been committed to a mental institution or “adjudicated as a mental defective,” they are not — repeat, are not — disqualified from buying a gun under federal law on those grounds. Look at Nikolas Cruz; his behavior raised any number of red flags, including several dozen police visits to his home. Yet none of those incidents or other outbursts rose to the level of a gun-deniable incident. He passed a federal background check and legally purchased his AR-15 rifle. So simply adding more records to the National Instant Criminal Background Check System, though necessary, isn’t sufficient. The reasons for rejecting a potential gun buyer have to be expanded — and extended to private sales. There must also be a more effective crackdown on straw purchasers and compliant gun stores. Actually, Chicago’s laws, though relatively tough, aren’t the country’s strictest. Further, the city borders Indiana and is close to Wisconsin, two weak gun-law states. Most of Chicago’s guns come from out of state. So what the Chicago experience actually suggests isn’t that tough guns law are ineffective, but rather that weak laws nearby make it easy to circumvent those statutes. In a debate chockablock with specious arguments, it’s important to understand the fictions and fog the gun zealots employ, the better to dispel them.